The climate is more continental than Marlborough’s and has similarities with that of Burgundy. 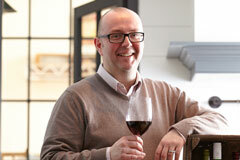 Matt Dicey coaxes ripe cherry fruit flavours, seasons them with toasty savoury oak and balances with tangy acidity. Wonderful with duck. This is one of the great Pinot Noirs coming out of Central Otago, a region in the centre of the South Island which has developed an enviable reputation for producing elegant age-worthy wines. With fresh, ripe morello-cherry flavours, it also has structure and tangy acidity. Wonderful with duck. Established in 1992, Mt Difficulty Wines is home to some of Central Otago’s oldest and most revered vineyards. Situated along Felton Road in the famous sub-region of Bannockburn, Central Otago, this unique area of extremes is ideally suited to crafting wines that speak with a sense of place. "My wife and I had the great pleasure of visiting this winery a few years ago and we were absolutely bowled over by the quality of their wines."